Heat an oven or a toaster oven to 205°C (or 400°F). Peel the onion and remove the root but keep the core intact. Cut the onion into 12 wedges through the core so that each wedge is held together at the bottom. Spray or smear a baking pan with olive oil and place the onion wedges in the pan. Lightly spray or brush them with olive oil. Bake the onion for 15 minutes, then remove them and turn off the oven. Sprinkle or drip the balsamic vinegar onto the onion wedges and place them back into the cooling oven. 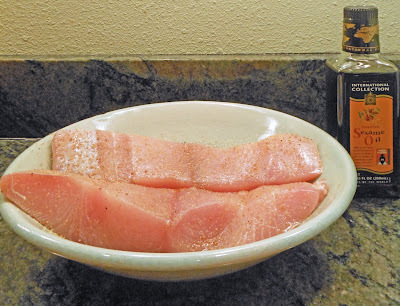 Place the monchong filets into a shallow bowl and coat them with the sesame oil, white pepper, and salt. Allow the filets to marinate for at least 15 minutes, then slice them into serving-size pieces. Peel and finely dice the garlic cloves or put them through a garlic press. Wash the okra and remove the tops. Peel the outer skin off the tomatillos, wash them, and cut them into quarters. Heat a wok or large skillet over high heat and add olive oil sufficient for stir-frying. Introduce the okra into the pan and stir-fry for 2 minutes, then turn the heat to medium-high. Add the tomatillos and stir-fry for 2 minutes. Add the garlic and stir-fry for 1 minute. Turn the heat to medium-low, add a little water if necessary, and cover the pan. Cook the vegetables for 3 minutes. Place the monchong pieces on top of the vegetables, cover the pan again, and cook for a further 3 minutes. Add the baked onion and the cilantro and stir to mix all the ingredients.